Phou Moncus is originally from Laos. Her family moved to the United States and resided here in Winston­Salem when she was 12 years old. As a little girl Phou was always in the kitchen helping her mother and older sister prepare food. Cooking was a family affair in her household. Needless to say, Phou had a hands-on experience in cooking at a very early age and she always enjoys cooking for her family and friends. 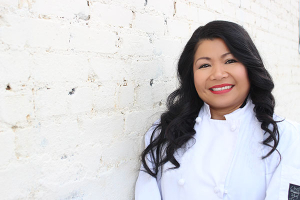 After 15 years of working in corporate America, Phou left her job and decided to pursue her passion for cooking and baking. She started her own business baking French macaroons called C’est L’amour. With Phou’s experience in leadership and coaching background, you are guaranteed to gain a better insight for cooking and baking. With her out­going personality you are certain to have a fun-filled experience.